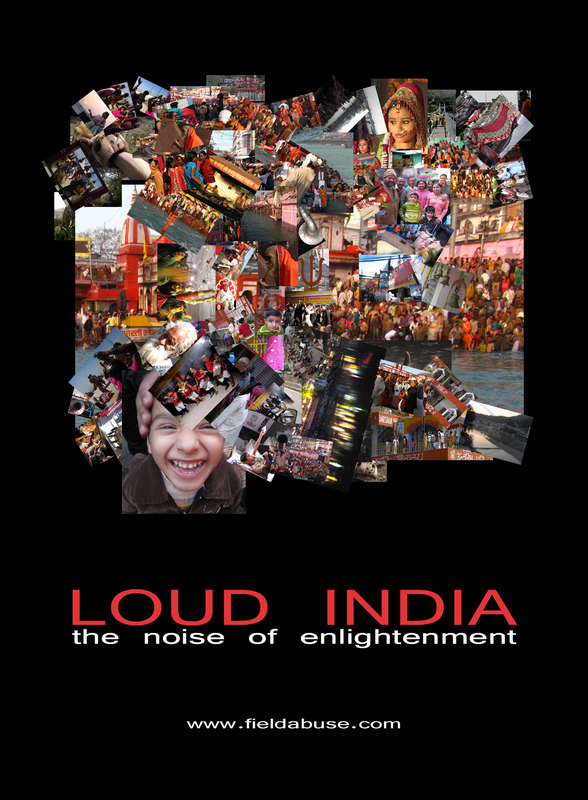 Loud India is an audiomentary, a kind of documentary where sound is more important than image. Loud India collects audio clips and photos of two North India cities. Rishikesh and Haridwar, in the state of Uttarkhand, are the places of this research work focused mainly on the relation between sound and religion. Both cities are located in the foothills of the Himalaya and along the banks of the Ganges River. Every year thousands of pilgrims and tourists visit those places attracted by temples and Yoga schools. Rishikesh and Haridwar, vegetarian cities by law, are considered to be some of the most holy places in India. Every twelve years a huge festival take place in this area. The Kumbh Mela, a massive pilgrimage in which Hindus gather at the Ganges river. According to the autorithies, from Jaunuary to April, about 40 million people had visited the two cities. On April 14, 2010, approximately 10 million people bathed in the Ganges river for the so called Royal Bath. Collecting sounds and images with an handy microphone and a digital photo camera, the authors visited the sacred places of the pilgrimage, met the people and shared with them the extreme spiritual experience of that festival. The result is a very intense video piece, thanks to the power of sounds, that helps the audience to get deep into the experience. Beside that, on the ground of the research work there is a demystifying intention. The goal is to reveal the contradiction between the idealistic look of the spiritual western traveller seeking for some enlightenment and the reality of a chaotic and noisy country. The material selected from the authors’ web archive testifies a cultural shock of someone visiting India; a shock mostly coming out as a sensorial crash. Different from the video clip, the “sound + photo” formula, used in the audiomentary, gives space to the imagination and makes both observation and listening acts of immersion but at the same time acts of creativity. Loud India arises from “Field Abuse”, an archive blog dedicated to the noise of the contemporary world.